We are all busy. We all seem to have several directions in which we are pulled. Today was one of those classic several-things-to-do and not-a-lot-of-time to do them in days. It started last week. After driving the MomMobile somewhere, I noticed a stinky burning plastic-like smell coming from under the car. I tried to ignore it. Then it happened again on Friday and Saturday. So on Saturday afternoon, I pointed it out to The Husband, who basically shrugged his shoulders and blew it off. Then on Saturday evening we went to dinner, upon returning home, I pointed out the smell again. This time The Husband acknowledged that it smelled a bit funky. Then on Sunday we went to the Padres games. We had tickets to hang out with The Boo Hoo Crew, a kids rock band that the girls love! Once we arrived at Petco Park, The Husband and girls all noticed the stinky smell. We popped the hood on the MomMobile but couldn’t see anything obvious – there was no smoke, no fires, nothing that looked like it was melting. So we closed the hood, went the game and that was that. When we got home from the game, the smell had gotten worse. So The Husband says that I should really take it in to get it checked out. Monday is my day off, so it’s the “easiest” to be without a vehicle. Just to be safe, we asked my dad if we could borrow his truck. The Husband would take the truck to work and I would take the MomMobile in for service and could drive The Husband’s car to get the girls to gymnastics after school if need be. So I called at 7 a.m. to make an appointment. The earliest I could bring the MomMobile in was noon. After reiterating that my car smelled like burning plastic to the service person, I made the appointment. I am fairly certain the gal I made the appointment with thought I was a little crazy. So noon, rolls around and I approach the service entrance. The greeter guy welcomes me and asks what the problem is. I explained to him that my car smelled funny – like burning plastic. He literally laughed at me and said, “Lady there is a joke there, but I’m not going to say it.” I laughed and agreed, it sounded odd to say my car had a funk, but I wanted it checked out. So one of the service managers came out. She walked in front of my car to get to the driver’s side. As she walked by my car, she made a funny face. Then said to me, “your car stinks.” I was grateful for the acknowledgement that I was not insane. The MomMobile did in fact stink. So she did a quick check to see if the plastic fender liner things were rubbing on the tires (a common occurrence apparently in lowered vehicle –of which the MomMobile is NOT!). 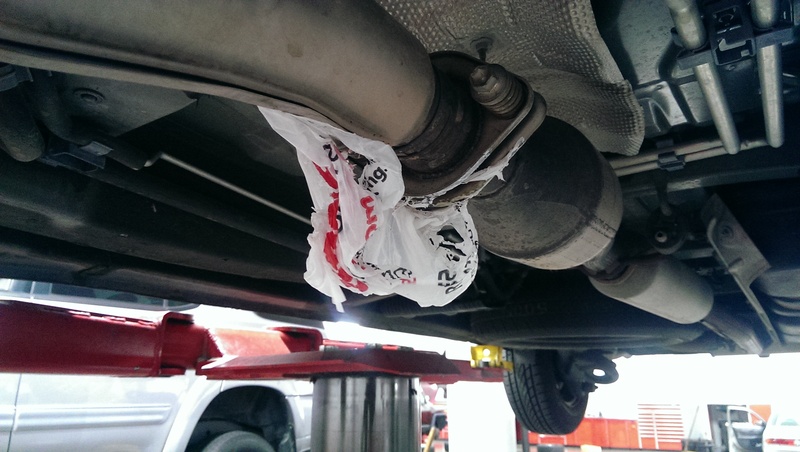 I jokingly said, it’s probably just a plastic bag stuck somewhere. She smiled and said maybe, but she couldn’t see anything on quick glance. So they would charge me $55 for the diagnosis and then deduct that from any necessary repairs. I waited for the shuttle to take me back home and left the MomMobile. Got the shuttle home, ate some lunch. My fabulous niece delivered my Scentsy order to me (YAY! https://rjones.scentsy.us/ – if you need some yummy smelling stuff). The day was going pretty well. I picked up the girls from school. We worked on a little homework and since the dealership had not called about the MomMobile, we took The Husband’s car to gymnastics. While at gymnastics, the dealership called and left a message saying the problem had been discovered, taken care of and the MomMobile was ready for pick up. Now at gymnastics, the Big One took a pretty good fall off of a bar, landing square on her face. So when she began complaining on the way home of a headache, I was not surprised. My head would hurt too if I had taken the fall she did. Since I forgot to grab my Bluetooth out of the MomMobile and I am not smart enough to synch my phone to The Husband’s car. I gave the Big One my phone and asked her to call grandpa to see if he could meet us at home and shuttle us to the dealership to pick-up the MomMobile. We would just have enough time to get my car, run through a drive thru for dinner and get to a 6 p.m. training for Girl Scout nut sales. It would be close, but I figured we could do it – despite the Big One’s headache! So we got home, grandpa enroute to our house and the Big One says, “My tummy hurts.” The Little One grabbed a bucket and the Big One sat on the couch. Trying not to freak out at a faceplant, followed by nausea, I offered for the girls to stay home alone while I picked up my car. The dealership is about a mile from home, so it’s a quick trip. The Big One really didn’t want to stay home. So we gathered their booster seats and a bucket and piled into grandma’s Jeep. We were not three blocks from home when the Big One started puking. Now just an aside, grandpa is a retired medical examiner investigator. The man dealt with all forms of dead bodies over a 20+ career, but he does not do puke. As the Big One is puking, I am trying to calmly reassure here that all is good. Meanwhile the Little One is excitedly providing a play-by-play. “MOM! Allison is puking! EWWWWWWW! It’s bright red! UGGGGHHHH! I think it’s strawberries.” My poor dad is driving and beginning to look a little urpy. I unrolled the window and calmly asked the Little One to just be quiet. I figure if we just get the dealership, we will all survive. Of course there was nowhere to park in the service area. So I told my dad to drop me off and then circle back around to where we had seen the MomMobile parked. I walked in and Kristen, the service manager, just had this look on her face. Before she said anything, I asked, “It was a freaking plastic bag wasn’t it?” She just started laughing and apologizing. All I could do was laugh. I certainly didn’t want to cry. I was close, but managed to laugh and told her about the kid puke in the car, etc. Turns out she was having a similar day. So we laughed and decided we’d each have a drink for the other tonight! So that there is $55 Vons bag. I am trying to keep things in perspective. A $55 bag is way better than a huge repair for something really broken. And since I am not at my nut training now there isn’t much to do other than open a Smirnoff Peach Bellini. Cheers!